Still getting it wrong the first time. Back in my Uni days, I bought what I thought was a pretty sweet soldering station - the Micron W/2172. If I remember right it cost about 4 weeks worth of part time wages, and I think it was worth it - it's lasted about 20 years so far. But, there are issues. I can't find a supply of new tips for it, and the last good tip is a conical one. So it was put away in the cupboard and I upgraded to a Hakko 396 station. Then I got to thinking... both stations used a 24V supply to heat their irons, so how hard would it be to graft a 907 handle into the Micron station? It would also be handy - I could load the Micron station with a big chisel tip for when you need a lot of thermal mass, standardise on one set of spares for both stations, and avoid having to swap tips on my Hakko all the time. WIN! There is a lot of information out there about the Hakko 907 handle, and this topic on the EEVBlog forum was exceptionally helpful. 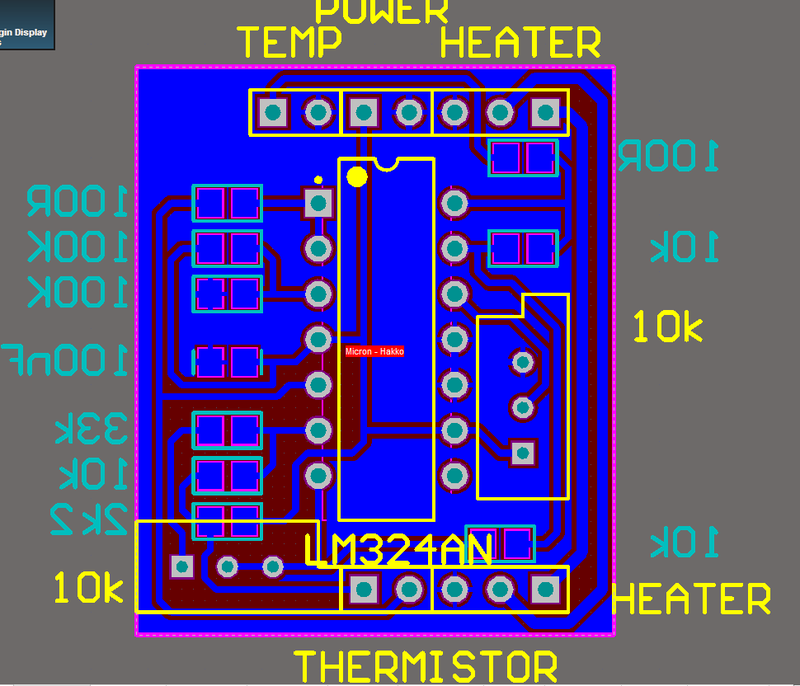 The important point to take away is that the 907 handle uses a thermistor to measure it's temperature. If the Micron does the same, it should be a simple mod. So, I whipped to cover off and started to take a look. My first impression is that the unit seems to be well built, and that might explain why it's lasted so long. Of course just staring at the board won't tell me anything. I really should take a look at the handle. Three screws later and the heater slid out of the handle. Flipping the board over, there was a pleasant surprise. Screw Terminals! This is a great idea - you can replace your heater with out needing working soldering iron. So, out with the multimeter and time to measure resistances. The red / white pair look like the heater pair (the connections on the PCB run off towards the MOSFET switch) and the multimeter shows a few ohms. That makes the yellow / brown pair the heater and .. that measures as a near dead short. Which is what a thermocouple looks like. Feck, it isn't going to 'just work'. My initial thoughts were to modify the existing control PCB, and after an hour of tracing the circuit, a simpler approach dawned on me. The original design uses an LM358, which is a dual op-amp. One half is used to amplify the thermocouple output, the other compares it to the temperature set point. Note that this station doesn't use a variable pot to set the temp, but a 5 position rotary switch. Also, there doesn't seem to be any hysteresis in the circuit. I guess the designers relied on thermal mass to damp any oscillations there. A few measurements later, I found out that the set point has a range of 400mV, around 9V. So if I build a little interface that has adjustable gain and offset, I can just disconnect the thermocouple amp, and feed my conditioned thermistor output into the comparator stage. This also has the advantage that if I want to return the station to normal, I can do so easily. 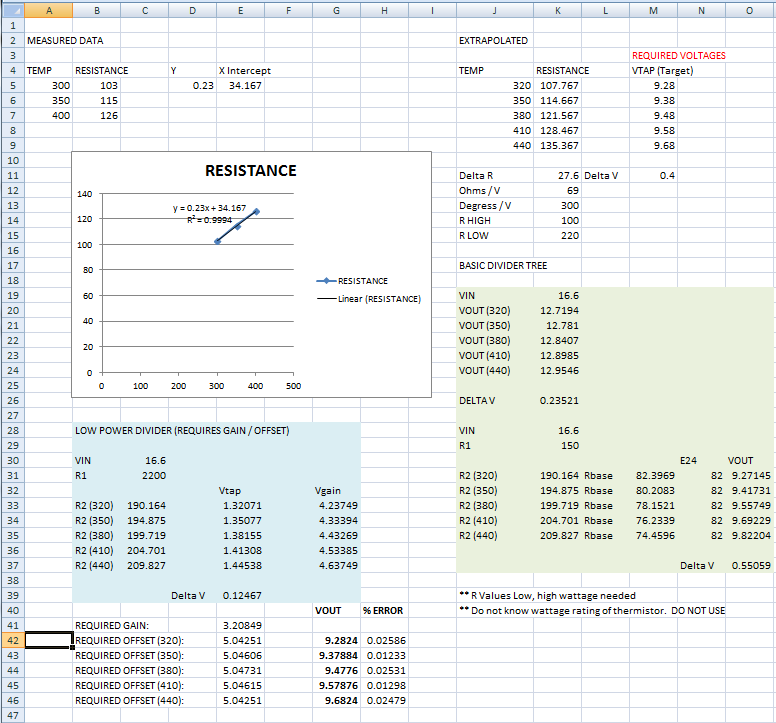 So, I broke out excel and did some actual maths (file here). With a gain of 3.2 and an offset of around 5V, I get an error of (much!) less than 1% compared to the old thermistor settings. Cool. 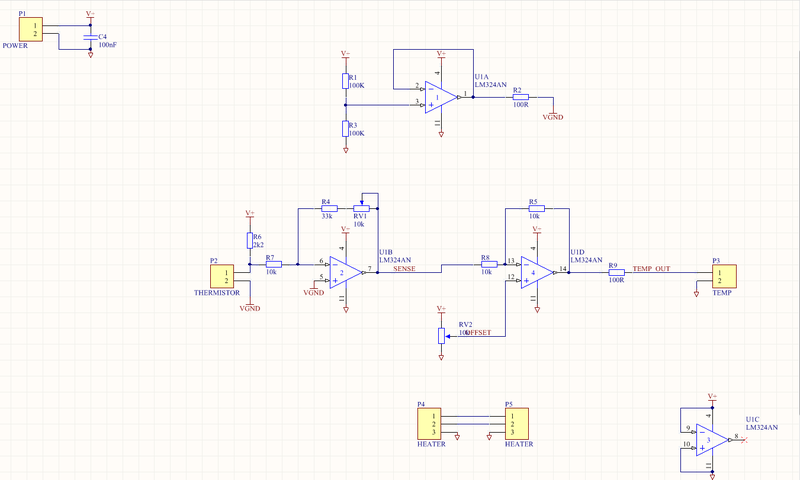 As I have a stash of LM324 quad op-amps I whipped up the above circuit. Quickly laid it out - single layer FTW! I then milled and assembled it. And bugger me, it worked first shot! I did simulate it in LTSpice first, which helps. So to install the change, I had to finish pulling it apart. Okay, I pulled it apart *before* milling my board - I needed to work out where it was going to fit first. Also, I wanted to look at the control board traces to help with reverse engineering it, and was surprised to see that the bottom of the board was coated in, well, crud of some kind. By shining my LED torch behind the board, it became obvious that the trace connecting the Earth of the soldering tip, to the earth cabling of the mains, had gone away! The pad labelled G should be connected to the pad labelled E.
Then the penny dropped. The crud was the pcb track that had been vapourised. Many moons ago the mains lead was tangled in the handle holder (iirc I was installing a car radio, with leads and wires all over the place), and when I absent mindedly put the handle in the rest, the tip soon melted through the mains lead, found active and scared the crap out of me with a all too close impromptu fireworks display. I do recall replacing the mains lead and being relieved that the soldering station still worked, but I never checked that the tip was still earthed! Pulling apart the new handle (the best $7 clone of the 907 I could find off of eBay), the red fibreglass sleeve shows the heater connections, the blue the thermistor connections. So before final assembly, I tested that the control board could heat the new handle. Soldered into place, and switched on, it rapidly drove the handle into overheat. Cool. After that I started to integrate the new handle and my interface board into the station. It all fitted rather neatly. Power was taken directly from the pins of the LM358, and pin 1 was cut to isolated the thermistor amp, with my board's output (white wire) going direct to pin 5 of the LM358. The blue wires are for the heater. I'd designed the board with the idea that the DC supply 0V would be common to the mains Earth and you can see the black wire from the handle is connected there. This was a bad thing, for two reasons. To make the tip ESD Safe, your tip should be connected to ground via 1Meg, not via a short circuit. Also, the DC supply 0V is ISOLATED from the mains Earth, so that doesn't work either. The fix was to 'air wire' a standard through hole resistor into place. Sorted. Of course, the next hurdle was to calibrate the unit. In the shot below I'm probing the set point and input of the comparator (scope is out of shot) and (also out of shot) I hooked up a thermocouple to tip of the handle. What I did before this was to measure the output of the thermistor and the it's amplifier (U1B in the schematic above) and adjusted the gain trimpot until I saw a gain of 3.2. (remembering it's all relative to a virtual ground via an inverting amp. Yeah, took a bit of grey matter to get that right!). The handle and thermocouple are out of shot here (on the floor - I ran out of hands) and set to calibrating the unit. Basically, I set the temperature to the middle setting (380 degrees C) which is the most used setting, and watched the input to the comparator rise. I'd set the offset too high so the tip was too cold when the heater turned off, so I was able to tweak the offset in small increments until I got a stable 380 on the thermocouple. I then checked the temp at the high (440) and low (320) ends and I was within +/- 5 degrees of the set points, and called it close enough. The front panel and the cables still fit above the interface board, and the cover went on. Win. All screws were found and assembly was completed. All I need to do now is find a sponge and a spot for it next to my Hakko and my tip changing days are over. Yes, I know I could have just bought a Hakko clone off of Hobbyking for not much more than I paid for the clone handle, but where's the fun in that. Plus, this station has way cool LEDs! And yes, if anyone has a suggestion as to how I could make this handle work with the standard LM358, I'm all ears. A friend gave me his 20 year old Micron W2172 and I will be needing this hack soon. Is there pcb artwork for a diy etched pcb? Or better still are your able to supply a pcb and hopefully some assistance with the hack? l have some experience building guitar effects pedals and hi fi, cd repair but might need support to successfully complete this hack as a project. What's All This KiCAD Stuff, Anyhow?